Hollywood beauties might bring on the heavy artillery after reading this one but the sooner they make peace with the truth, the sooner they can get on with their lives: there are some stars out there they just can't compete with. Frankenstein is one of them. If you are ignorant enough to disagree then ponder on this: what does Frankie get that other celebrities don't? He spends as much time doing his make-up. He gets an equal number of people to fuss over his costume, which by the way, is sewn to perfection. Plus his friends get to make all kinds of grunts and roars, which are easier on the ears than damsel-in-distress screams. If you were thinking Frankenstein was alone, think again. A host of legendary movie monsters have made their way to stardom. And these freakish monsters have their own human admirers outside the circle of people who love and create them. Dracula, The Mummy, The Wolf Man, The Phantom of the Opera and Dr. Jekyll and Mr. Hyde all have their own Malibu addresses and if they were real, would have been driving vintage cars right now. For the less informed, Frankenstein was not always the tall, dark and handsome dude that you see around lately. Initially the monster appeared in Mary Shelly's novel where he was not given enough respect to have a name. Instead Shelly referred to him as 'the creature' or the 'fiend' but once the film adaptation came along he took his revenge and bagged the name Frankenstein, a.k.a. 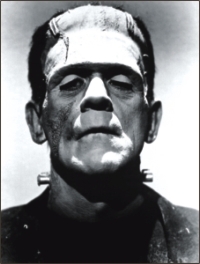 Frankie (in the original Dr. Frankenstein was the name of the creator of the monster). Eight feet in height, with yellowish skin and eyes and flowing black hair it's simply Tinsel town politics that kept this dude out of the list of the world's most beautiful people! Sensitive, emotional and gentle Frankenstein was your average hopeless romantic in search of his happily ever after. Yet people judged him by his looks, expecting him to pull their intestines out, eventually turning him evil. What was Frankie's only wish? That people judge him by his personality and not be prejudiced against him because he has 'the look'! A cute, green ogre with a lovable Scottish accent- that's Shrek for you! A perfect gentleman, though not in the 'usual' sense, Shrek is a loner, getting by in his swamp, never having to pretend to be someone he's not. One fine day, his peace is destroyed by the arrival of illegal Mexican immigrants. Okay, they weren't totally Mexican they were more like 'fairy tale creatures'. In an attempt to get them permanently deported, Shrek embarks on an adventure with a talkative donkey named Donkey, and eventually ends up finding his true love Princess Fiona. By the end of the movie, Fiona turns from a beautiful, feisty princess to an ugly ogre adding to Shrek's joy. The name Shrek comes from 'Schreck' which is German for fright and the movie we love so much is loosely based on William Steig's 1990 fairy tale picture book. Once again, Shrek has the appearance of a monster but not the soul. Describing himself as having layers like an 'onion', Shrek is misunderstood and feared for his looks. Rather than trying to prove the world wrong though, he finds it easier to help people be afraid of him by acting the way they expect him to. In the end however, he finds true friendship in his stallion a.k.a. Donkey and true love in Fiona, which is basically what an ogre really wants. Humans want the same things, but they are hardly ever as lucky. The name "Godzilla" is the combination of two Japanese words: gorira meaning 'gorilla' and kujira meaning 'whale'. This is just a personal opinion but Godzilla, but to me he bears a striking resemblance to Nessie, a.k.a. the Loch ness Monster! But unlike Nessie, Godzilla is one party animal! He's a bad boy who lives merrily on the ocean floor where he can travel at the speed of a nuclear powered submarine and sometimes goes for evening strolls. His diet is restricted to mammalian meat of whales, but when he's tired of that, he indulges himself by coming on land for some fast food. When his sleep is disturbed by loud pop music or when he's in the mood for a shopping spree, he makes a special appearance in Tokyo or some other big city by the sea. Once there, Godzilla usually heads for downtown where he enjoys window shopping, destroying buildings and turning over whatever stands in his way. His strongest weapon is his distinctive Atomic Breath (it's hard to brush one's teeth underwater). His most distinctive trait is his roar. Created by a nuclear blast, his sheer size is caused by nuclear mutation and strange powers unleashed from man splitting the atom. Godzilla was first seen in the 1954 film Gojira, produced by Toho Film Company Ltd and has since starred in twenty-eight films (that's more than Lindsay Lohan). Despite problems with his visa and being unable to show intention to return to the sea, Godzilla managed to pay New York a visit in the 1998 version of the story (where the blame of his birth went to the French blowing up islands with atomic bombs). The American rendition was heavily criticized and later given the name Fraudzilla because it was totally different from the original. We have no further comments. Mummies have made their way into numerous movies and cartoons including the 1999 film The Mummy and its sequel The Mummy Returns. The character in popular culture is often compared to that of Imhotep, the first architect, genius and physician known in written history. His name which means the one who comes in peace, has been used in a multitude of movies and books about destructive monster mummies. The irony is almost painful. In the film we are all familiar with, his girlfriend Anuksunamun kills herself hoping to be resurrected by Imhotep. Of course it's a big mistake. The pharaoh's guards catch him in the act and Imhotep is forced to endure the curse of Hum Dai - his tongue is cut out and he is buried alive with a swarm of flesh-eating scarabs. He is unable to die and must endure the agony of his wounds for all time, a lot like Voldemort. He doesn't have to look bandaged like he had endured public wrath for too long in the movie, eventually getting the good looks of Arnold Voslo. Imhotep is accidentally released thousands of years later thanks to explorations initiated by Rachel Weisz's character Evelyn, and begins killing left and right. His ultimate goal is to resurrect his girlfriend for which purpose he kidnaps Weisz as a sacrifice. All ends well when the hero, Brendan Fraser (Rick) saves the day. In the sequel, Imhotep pays a surprise visit, this time bringing along his resurrected girlfriend with the goal to eliminate the Scorpion King. However, in the end when both Imhotep and Rick are dangling from the edges of an opening, Evelyn risks falling debris to save her husband but even when Imhotep cries for Ancksunamun to save him as well, she flees. All that trouble for the wrong girl? Apparently Imhotep also realizes his ex-girlfriend was not worth cheating death twice and with a sad smile let's go and falls into the pit of fire. Jurassic Park is a novel written by Michael Crichton about a park that contains cloned dinosaurs, which have been recreated from damaged dinosaur DNA found in mosquitoes trapped in amber since ancient times. How cool is that? Apparently not too cool! When things go haywire in the park and security is left off, the dinosaurs escape and decide to have a little get-together for old time's sake. Of course, that wasn't the best news for the rest of mankind. Universal Studios paid Crichton $2 million for the rights to the novel in 1990, before it was even published. The Steven Spielberg-directed film adaptation was released in 1993, giving Tyrannosaurus Rex his first big break in the business. It was the first popular movie to portray dinosaurs relatively accurately, due to paleontologist Jack Horner's guidance during filming. Supporting cast included Brachiosaurus, Dilophosauru,s Gallimimus, Parasaurolophus, Triceratops and Tyrannosaurus. The film also created a generation of dinosaur-crazy children and the subsequent rise in the number of palaeontologists. * * *There are more reasons than one as to why any self-respecting writer or movie maker would waste time or money on something that bears no resemblance to Jennifer Anniston. However, movie monsters have thrilled audiences for generations even when cinema was black and white and the actors were mute. In the two and a half hours in which we let our imaginations run wild, monsters accomplish a lot: they make teens admit they are still afraid of the dark, they give mums the chance to complain and they give psychos the joy of seeing blood and gore. Yet, the message they deliver is more complicated than that. Monsters are a reflection of human beings, of our actions and of our hypocrisy. Our addiction of meddling with things we ought not to meddle with, usually lead to the birth of a monster and our habit of judging others from their looks leads to their becoming malevolent. Movie monsters are not evil. They are misunderstood.